Kids vs. parents! 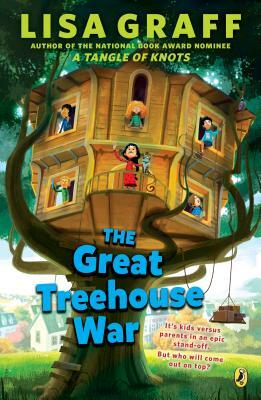 An epic treehouse sleepover! An awesome group of friends! An exciting new book from National Book Award finalist Lisa Graff. Lisa Graff (www.lisagraff.com) is the critically acclaimed and award-winning author of Lost in the Sun, Absolutely Almost, A Tangle of Knots, Double Dog Dare, Sophie Simon Solves Them All, Umbrella Summer, The Life and Crimes of Bernetta Wallflower, and The Thing About Georgie. Lisa Graff’s books have been named to more than forty state award lists and have been touted as Best Books of the Year by booksellers, teachers, and librarians. A Tangle of Knots was long-listed for the National Book Award in 2013. Lisa Graff lives with her family just outside of Philadelphia. Follow her on Twitter @LisaGraff.